We know that Chevrolet, like the rest of GM, is deeply committed to an all-electric, combustion engine-free future. Not everyone is happy about that but it’s something we all need to get used to. While its powerful V8s aren’t going anywhere just yet, Chevrolet is already laying the groundwork for 20 all-electric vehicles by the year 2023. According to GM Authority, the automaker has just filed a trademark with the United States Patent and Trademark Office for the name "Bolt EUV.” Yes, really. 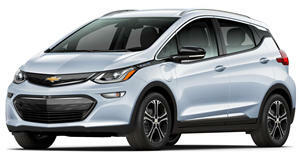 The Chevrolet Bolt, as we all know, is the all-electric hatchback that continues to be a solid success. And Chevy figures why not continue that success with a deviation of that nameplate. Yep.